I thought about running on Saturday, but it was just too damn cold. I decided an hour of yoga would be good enough for the day. 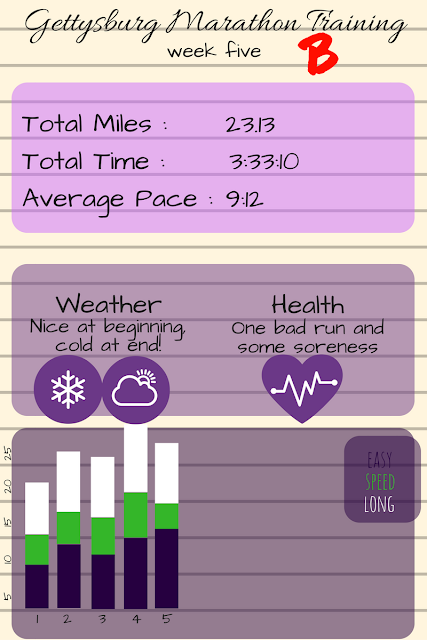 Nice job getting out there and getting your long run done! I'm glad you recognized something was up and didn't push yourself to finish. And that you shared the good and the bad of your training with us! I wonder what happened on Wednesday? Was the gym too hot? Maybe they cranked the heat too high to compensate for the cold outside? Heat can do that to you no matter how much water you drink, right? Good for you for getting outside to run. Yes, I do believe that once you get started it't not all that bad. dizzy? on no! I get dizzy sometimes from drinking water too quickly... it's weird, but it happens. you had a great week!! Given the weather, I think you did great! I feel like running longer than 1 hour in the extreme cold is incredibly tough because you really do get colder and end up frozen. So congrats on getting that 9-miler done!